I've mentioned before I use to oil paint but gave it up, mainly because I was too lazy to deal with the cleanup (seriously) and when I painted I mostly painted landscapes sometimes wildlife and if I was using water colors, floral. My most recent quilt is a return to my love of landscapes. After I knew what direction I wanted to go in I looked to both Mary Stanley's lake quilt and Mickey Beebe's Eichler Homes quilts for design direction. 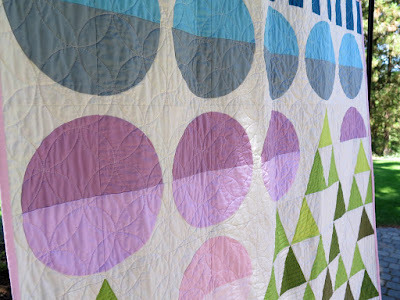 They were a great starting point for this stylized modern geometric quilt. I spray basted this quilt, which I loved! It was the first time I spray basted such a large project. I also tried out a new (new to me) quilt design. 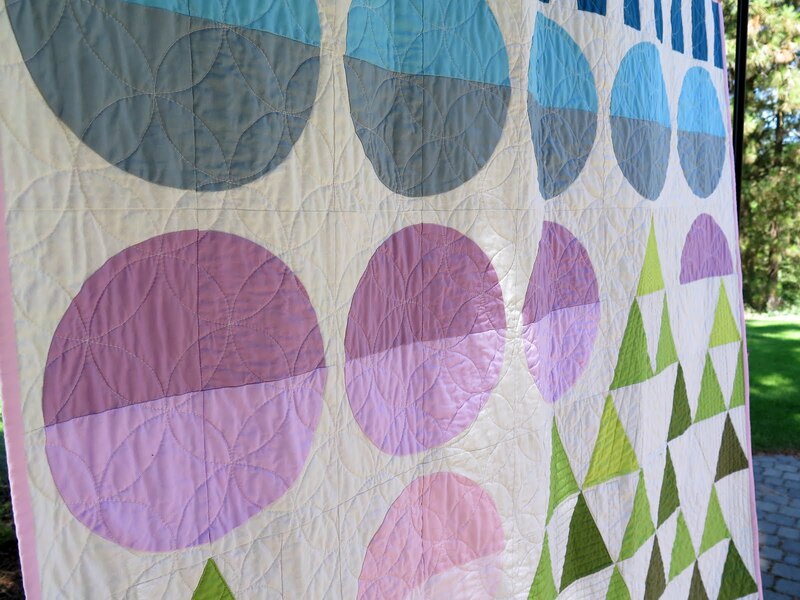 I really like how the quilting on this project turned out. I have to admit that I marked out the "sky" pattern before quilting and used a walking foot but it went quickly, despite turning my machine's speed all the way down to the slowest setting. Quilting has never been my strongest quilty skill. I also decided to piece the back using a print from Tula Pink's Chipper line. 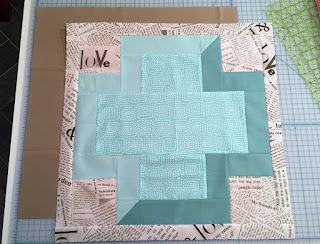 In addition to finishing up this quilt I've been designing some new blocks. 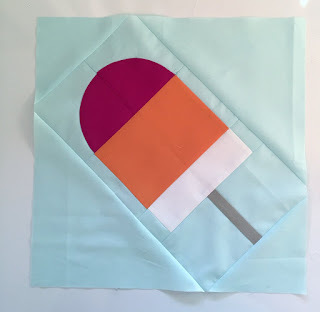 One is a plus block with a bevel and the second is a Popsicle inspired by a promo email sent out by Craftsy.com. 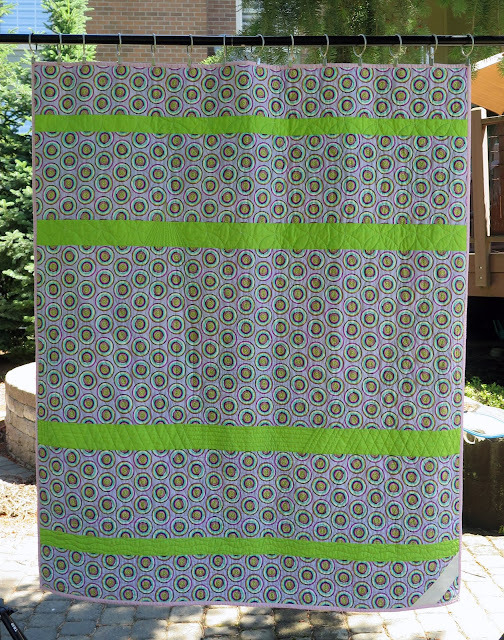 Finally, I need to go back to working on my double wedding ring quilt. I don't have too many WIP's but this one is so easy to put down for whatever reason. Ok, I know the reason it's pretty intense piecing. No Excuses! I found this quilt on flickr and I think it is a lovely interpretation on the "Moon Over Mountains" theme. Lovely use of color. 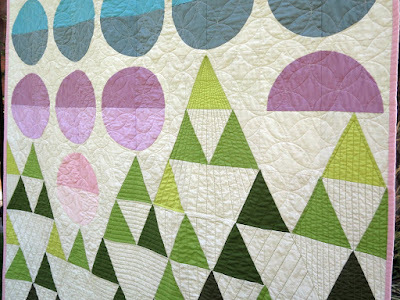 I LOVE your Mountain Scene Quilt!! LOVE LOVE LOVE! Do you have a pattern for it? Thank you, I don't have a pattern but I'd be willing to put a layout with measurements what templates I used, and fabric colors on my site. I wish I could give you a time frame for that but I've got a few projects going right now and a different pattern I'm writing but maybe in the fall after some of the quilt shows are over. Again thank you for you kind comments I am very pleased with this quilt and it makes me smile when I look at it. 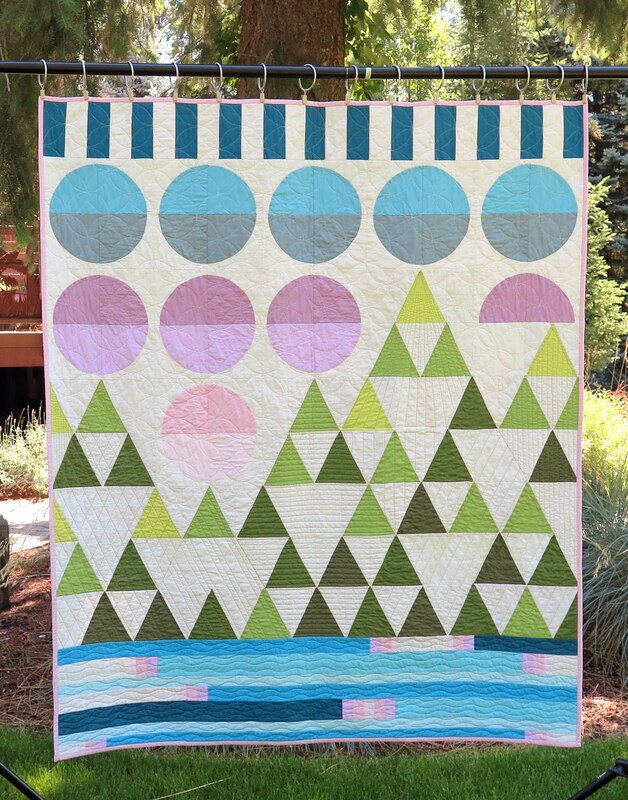 This is really a gorgeous quilt and a fun take on a landscape! 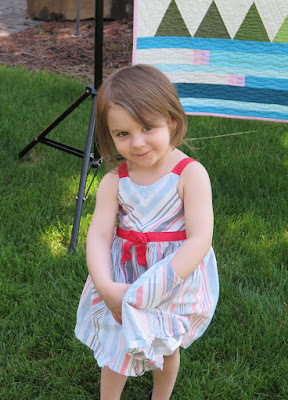 Beautiful--and what a cute helper! What a lovely quilt! I just love the abstracted take on a landscape quilt. Beautiful colors too!! Thank you Mel! This quilt means so much to me I'm glad you enjoy it.